To uncover the spellbinding tales that lie hidden within Scotland's wild and romantic shores, to experience what inspired the country's powerful literature and towering castles, and to tread in the footsteps of her villains and victors, is to capture the spirit of this fascinating country and bring every place you visit to life. The inspiration for the primetime ITV series on Great Britain, this is the ultimate journey around Scotland from bestselling author Christopher Winn. Travelling county by county, this irresistible miscellany unearths the enthralling stories, firsts, birthplaces, legends and inventions that shape the country's rich and majestic history. To uncover the spellbinding tales that lie hidden within Scotland's wild and romantic shores, to experience what inspired the country's powerful literature and towering castles, and to tread in the footsteps of her villains and victors, is to capture the spirit of this fascinating country and bring every place you visit to life. You will discover the story of the original 'sweetheart', John Balliol, whose embalmed heart is buried beside his devoted wife Devorgilla at Sweetheart Abbey in Kirkcudbrightshire. In Aberdeen you will find the only granite cathedral in the world. And you will hear the haunting echo of the Bear Gates of Traquair House in Peeblesshire were slammed shut when Bonnie Prince Charlie left Scotland in 1746 - legend has it that they will never be re-opened until a Stuart King once more sits on the throne. 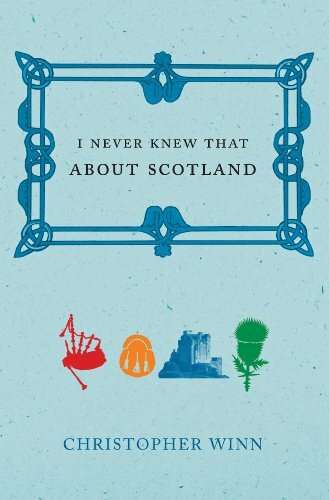 This beautifully illustrated treasure trove of interesting facts about the history of Scotland is the perfect gift, and will act as an eye-opening guide to this thrilling, alluring and ever-bewitching country.